The Oman Business Road Show has just completed its second stop in the United States - in Chicago, Illinois. The focus of the visit to "The Windy City" was on industry and transportation, with a special emphasis on rail networks, for which Chicago serves as a hub for the nation. Chicago also showcased its world-class inland port, which may serve as a model for a comparable port that Oman is constructing in the Barka region. 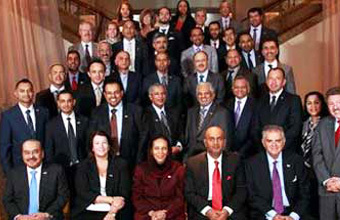 The Oman Business Road Show has just completed its second stop in the United States - in Chicago, Illinois - hometown of U.S. President Barack Obama. The focus of the visit to "The Windy City" was on tourism and transportation, with a special emphasis on rail networks, for which Chicago serves as a hub for the nation. Illinois also showcased the largest inland port in the United States, which may serve as a model for a comparable port that Oman is constructing in the Barka region. Leading the commercial Road Show is H.E. Ali bin Masoud Al Sunaidy, Oman's Minister of Commerce and Industry, who is joined by Oman's Ambassador to the United States - Her Excellency Hunaina Al-Mughairy - and the U.S. Ambassador to the Sultanate of Oman, the Honorable Greta C. Holtz. The delegation is composed of more than 40 business leaders, representing many of the top companies in Oman, as well as a handful of small and medium-sized enterprises (SMEs). The Road Show is being organized by the National U.S.-Arab Chamber of Commerce.